In Colorado, a curious marriage has formed between the booming retail cannabis industry — legal in the state since 2014, but not in the eyes of the federal government — and young war veterans, more than 200 of whom have jobs protecting marijuana businesses across the state. For some, a cannabis security job is a way station toward the police department or law school. For others, it is a vocation with purpose, a union of two outsider groups leaning on each other in a nation uncertain about how to accept them. The owners of Colorado’s 978 marijuana shop licenses and 1,393 marijuana grow licenses are particularly vulnerable. Because the federal government considers marijuana illegal, many banks won’t work with cannabis businesses, forcing them to deal in mountains of cash. Perhaps more significant, their product is also lucrative for criminals: A pound of marijuana worth $2,000 in Colorado can be sold for $4,000 or $6,000 across state lines. Stores and grow houses are often soft targets in darkened parts of town. And unlike cash, marijuana is untraceable, easily sold on Craigslist or driven to dealers in Chicago and New York. The department said it believes that the city’s marijuana businesses have been targeted by organized groups, though it has no evidence that the groups are linked to foreign cartels. Surveillance videos of some burglaries show thieves sawing through the roofs of businesses, tracking law enforcement with police scanners, and tying up employees. In one case, in southern Colorado, a pair of guards spotted four men in tactical gear carrying AR-15 rifles through a field. The watchmen, former Marine snipers wearing night-vision goggles, scared them away with warning shots. Denver, one of the few jurisdictions compiling data on crimes at marijuana businesses, has 421 pot-growing houses and shops. It recorded 192 burglaries and thefts at such businesses in 2015. In Aurora, a suburb with 19 operating pot shops, 18 burglaries and robberies have occurred since 2014. Criminals have netted anything from a few marijuana-laced sodas to a quarter-million dollars in plants. In June, much worse occurred: Two armed men entered a pot shop in Aurora, called Green Heart, and killed a guard, Travis Mason. The police called it a botched robbery. Into this world stepped Bowyer, fresh out of the Marine Corps. He joined the military in 2004 at 17 to see the world. He ended up in combat, most notably in Iraq in 2006 and 2007. A bookish Episcopalian, he had considered the priesthood. After experiencing war, he lost his faith. When he left the military, he wandered, taking a job as a frack hand in North Dakota and at a moving company in Colorado Springs. In Denver he found an ad on Craigslist for a company called Iron Protection Group. “The way it read, it was written by guys like me,” he said. It was. Iron Protection Group was formed in 2014 by Hunter Garth, Cory Aguillard and Caleb Patton, Marines who had served in Afghanistan but were disoriented in the civilian world. They wanted to find jobs for former fighters who were now sleeping on one another’s couches, living on ramen noodles and roaming in search of a purpose and a sense of family. Two Army veterans joined them in founding the company. “It started out as brothers helping brothers,” said Patton, 31. In some ways, it was a natural marriage, formalizing a relationship forged in Vietnam, where marijuana became a balm for soldiers seeking to calm the demons of deployment. Garth said that about half of his employees smoke marijuana, though he asks them to refrain from doing so eight hours before a shift. “Eight hours jigger to trigger,” he said, is the rule. The pay starts at $12 an hour, or $25,000 a year based on a 40-hour workweek. (The average salary, Garth said, is more like $38,000.) But that doesn’t reflect the benefits of camaraderie. 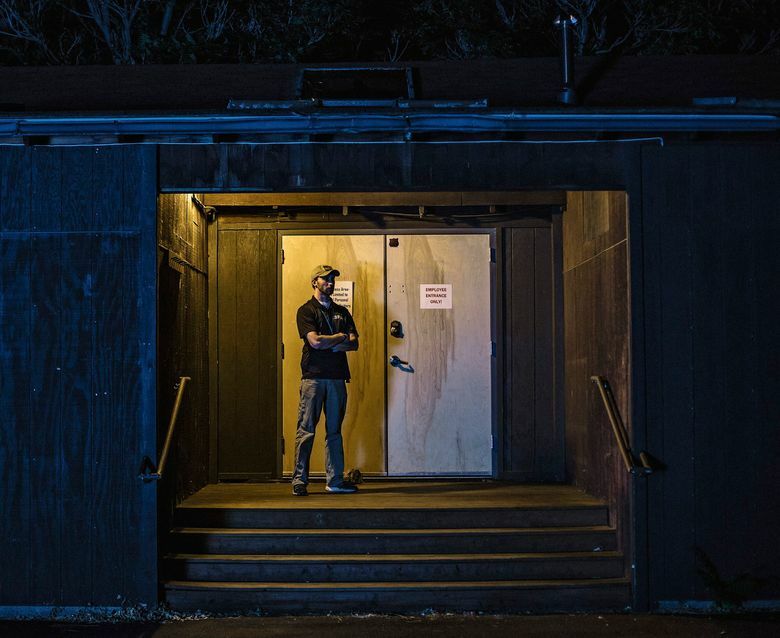 At a shooting range tucked into the Rockies, where 10 employees of Iron Protection Group are training, Curtis Simmons, 30, awaits his turn to shoot. He spent four years in the Army, including a stint in the Korangal Valley of Afghanistan, a scene of fighting so fierce it was known as the Valley of Death. Working in the marijuana industry, he said, makes him feel “like a protector.” There are liberals and tree-huggers there, too, but they understand him, he said: He smokes to keep the symptoms of post-traumatic stress disorder at bay, and he gets recommendations about cannabis strains from his security clients. “They want to know: ‘What’s your issues?’ ” he said. Simmons would like to become a police officer. But you can’t be a policeman if you can’t pass a drug test. “This is as close as I get,” he said.